Limiting How Long You Have To File a Claim | Kalijarvi, Chuzi, Newman & Fitch, P.C. Employment agreements often are lengthy, complicated documents which are routinely presented to the employee on a “take it or leave it” basis. Sound familiar? Indeed, it is increasingly common for employment relationships to begin or end with agreements, often with terms that are decidedly pro-employer. For instance, provisions compelling arbitration have been the focus of much recent discussion focused on the lack of fairness in employment agreements. Or consider, a recent potential client living locally and working remotely, who was shocked to learn that her employment agreement required that any breach of contract lawsuit had to be filed in Illinois. Typically, employment agreements run for several pages and to non-lawyers, appear to consist of nothing more than meaningless boiler-plate. Critically, however, the terms buried in the legal language can have far-reaching and binding consequences and cannot be overlooked. For example, some agreements restrict the time allowed for an employee or former employee to challenge rights or obligations under the agreement. This is called a “statute of limitations.” A reduced statute of limitations can mean that an employee may lose the right to file a claim against the employer if they wait too long. 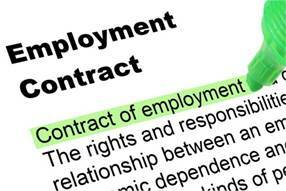 Increasingly, we are seeing a contractual reduction of the statute of limitation in employment contracts. This blog looks at the validity of such a provision in Maryland, and future blogs will review the status in Virginia and the District of Columbia. The Maryland Court of Appeals recently permitted such a limitation on time to file that was agreed upon by the parties. In Ceccone v. Carroll Home Services, LLC, 454 Md. 680, 165 A.3d 475(2017), the Court of Appeals reviewed the validity of a contract between the parties that reduced the limitations period for a breach of contract from three years to one year. In remanding the case to the trial court to consider reasonableness and evidence of misrepresentation and/or fraud, the Court of Appeals held that a contractual provision that shortens limitations period is enforceable only if there is no controlling statute to the contrary, the provision is reasonable, and the provision is not subject to other defenses such as fraud and is not a product of fraud, duress or misrepresentation. Ceccone v. Carroll Home Services, LLC,454 Md. at 693-94, 165 A.3d at 482-83. Focusing on the issue of reasonableness, the Court of Appeals provided guidance that among the factors to be considered in assessing reasonableness are “the subject matter of the contract, the duration of the shortened limitations period compared to the period that would otherwise govern, the relative bargaining power of the parties to the contract and whether the shortened limitations period is a one-sided provision that applies to one party but not the other.” Id. at 694, 165 A.3d at 483. Recognizing the principle of freedom of contract, the Court still noted that many of the cases it cited upholding shortened limitations period involved sophisticated contracts between parties with roughly similar bargaining power. Id. at 695, 165 A.3d at 484. This equal bargaining power often is missing in the employer-employee relationship. Even though Ceccone was not a dispute between an employer and employee, its analysis should be used as authority for employment agreement disputes. A contractual reduction in the statute of limitations was at issue in an employer-employee dispute in Client Network Services, Inc. v. Smith, 2017 WL 3968471 (D. Md. September 8, 2017). In Smith, the unambiguous clause referenced only the responsibilities of the employee, and Judge Grimm found that the statute of limitations provisions were intended to apply unilaterally to the employee. Though referring to the Ceccone analysis and factors assessing reasonableness, Judge Grimm analyzed the provision in the same manner as an arbitration provision, ruled that unilateral statute of limitations provisions in a contract “are permissible under Maryland law when supported by a ‘valid justification’” and cited Walther v. Sovereign Bank, 386 Md. 412, 872 A.2d 735 (2005) (unilateral arbitration clause is enforceable when supported by a valid justification). Without any justification, the Court ruled that a one-sided term “may be substantively unconscionable and, if also procedurally unconscionable, void. Smith, 2017 WL 3968471 at *3 (Emphasis supplied). This decision appears to add hurdles for employees to overcome and weaken employee protections against one-sided contractual provisions set forth in Ceccone. We will have to watch cases coming up in the next year to see if the Maryland courts will allow the one-sided terms seen in Client Network Services. If you want help understanding an employment agreement, Kalijarvi, Chuzi, Newman & Fitch’s attorneys would be happy to advise you. PreviousSo, You’ve Decided to Hire a Lawyer: Where Does Your Spouse Fit In?